Have you ever been at that place where it's the end of the month, the grocery budget is looking a little bare, and its time to get creative? 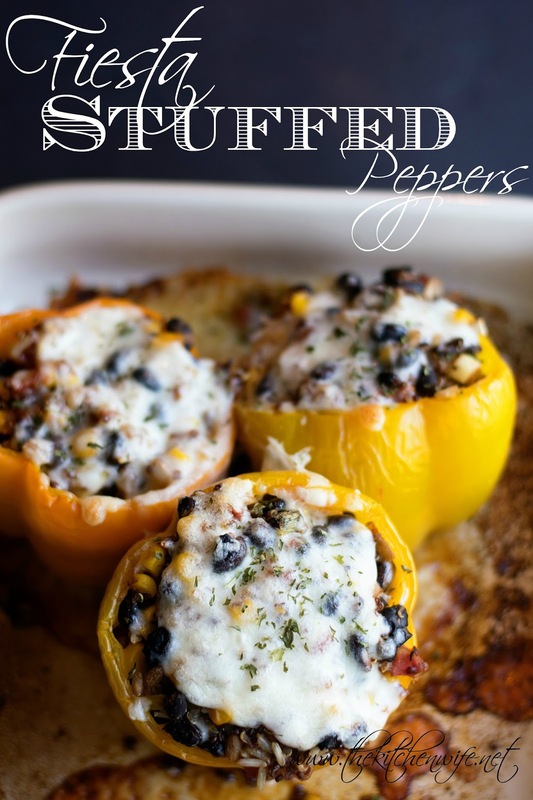 Yeah, that's where I was at last week when I came up with these Fiesta Stuffed Peppers. Next you will to prepare your choice of grain and add it to a large mixing bowl. I used an Ancient Grain blend from Aldi, but you can use rice, quinoa, barley, whatever you have on hand. The best part is many places are offering ready made grains in their freezer sections. you only need to microwave them. Talk about a time saver! 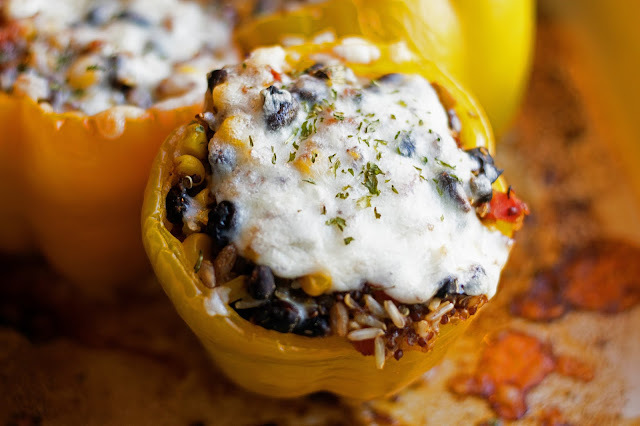 Now simply stir everything together and the filling for the Fiesta stuffed peppers is complete! It really does look like a fiesta in your bowl, doesn't it? Now to prepare the bell peppers you will need to cut the "cap" off of the top of the pepper and clean out all of the ribs and seeds. I don't remember who I saw do this, but the other day while watching The Food Network one of the hosts trimmed the tips from the bottom of their peppers to help them better stand up in the pan. This worked splendidly, so now I'm suggesting you do the same! All that's left now is to place the filling into the bell peppers and sit them into a greased baking dish. You can absolutely keep these vegan, or you can add a little shredded cheese of your choice to the top. Cover and let them bake in the preheated oven for 30 minutes. After 30 minutes, uncover and cook for 15 more minutes to let the cheese get golden brown! 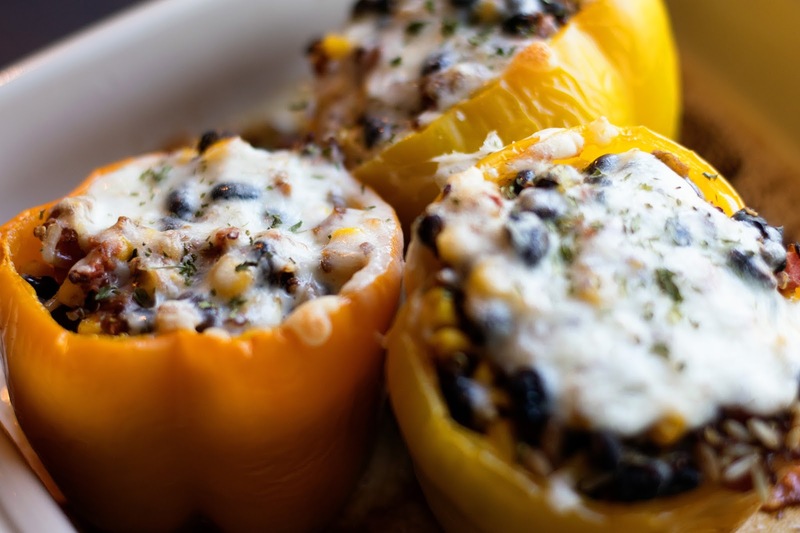 Now your Fiesta Stuffed Peppers are ready! Prepare the grains of your choice and place into a large mixing bowl. To the grains add the corn, beans, scallions, diced tomatoes with chilies, chili powder, cumin, garlic powder, salt, and lime juice. Mix it all together. To prepare the peppers, cup the top of the pepper off and clean out the seeds and ribs. Then, trim the very tips off of the bottom of the pepper. This will help them stand upright in the baking dish. Fill the peppers with the filling and, if you choose to do so, top with the shredded cheese. Cover with foil and place into a 350 degree oven for 30 minutes. After 30 minutes uncover and cook for 15 more minutes.